If you’ve not been before, the hamlet of Milner is a beautiful place. Milner is a small area in the heart of Langley with rolling green hills and large forest groves. The landscape is dotted with multi-coloured barns and a smattering of livestock against the green hills. While naturally picturesque, this land is also stamped with the vast experience of several generations of farmers. It is here that fourth-generation dairy farmer, David Davis, lives and farms. In 1870, David’s great-grandfather Henry purchased 121 acres in Milner and started a dairy farm. David’s grandfather, uncle, and father have since run the dairy operation continuously since Henry began. David’s father Hugh, though retired, still lives on their land in Milner today, and fondly remembers the farm as a very diverse operation growing up. Before the 1960’s, the Davis farmstead included broilers and layer chickens, a couple of pigs, vegetables crops like potatoes and turnips, an orchard, and a cistern for collecting rain water. When Hugh began farming in 1966 with 15 cows, he, like many farmers at the time, began to focus more squarely on the dairy operation, and included less diversity as a consequence. Since then, the Davis farm has grown steadily. Today, David’s farm operation is significantly larger than in 1966, with 210 cows and 24 automated milking units. A milking parlour runs 12 hours a day, and these productive cows together produce 5000 liters of milk per day. Just one of David’s cows can produce 35 liters per day – that’s just shy of nine 4 liter plastic jugs of milk you would find at the grocery store! Like most things in large-scale farming, this kind of productivity depends on the number of efficiencies present throughout the operation. 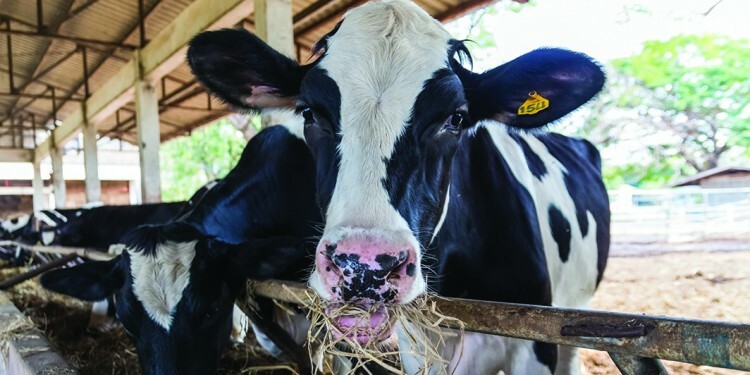 According to David and Hugh, one of the most important efficiencies for their farm, and for the dairy industry at large, has been a high success rate in breeding cows through artificial insemination (AI). In order to produce milk, cows must be impregnated and produce a calf. AI has a very high success rate for breeding cows, especially if you consider that in the early 1950’s farmers bred their cows literally by hand. The first year the Davis’ used AI, they bred 20 out of 21 cows, an astonishing statistic that inspired a change right away. While David needs to keep up with current developments in farm technology, he is keenly aware of the limits to development. He never loses sight of the decades of hard work by farmers before him who made our efficient food production systems the way they are today. David knows firsthand that protecting farmland is essential to our communities. Farmland literally produces essential sustenance for the human body, food, while at the same time forging natural and unique relationships between people who live nearby. And now, more than ever, David knows the value of how important farmland is – because it is slowly disappearing. Milner is very close to the City of Langley, a region of the Fraser Valley growing rapidly from an influx of people moving to the area. In response to this movement of people, there are a number of housing developments surrounding Milner. Today, the Davis’ dairy is within one mile of 600 homes, and over then next 10 years, more dwellings will be built within the same radius to accommodate 40,000 new people. “We’ve lost so many family farms. Twenty years ago there used to be 3000 milk producers, now there’s 600 in the Fraser Valley.” It addition to the loss of viable farmland for farmers, these housing developments affect farmers who stay on through the their construction. The new neighbours don’t always understand the established practices of dairy farming, like the smell of manure, or the sounds that tractors make. As a father of five children, a councilor for the Township of Langley, and of course, a dairy farmer, David is a passionate, and busy man. His work is carried forward because the work of his forefathers and the generations of farmers in Milner. This legacy provides an intimate knowledge of where farming comes from, and where it’s been. David’s task – as well as all of ours – in our contemporary times, is to help direct where farming is going, and ought to go for its long term vitality. As a city councilor, David is balancing the success of his farm, and the farms around him, with the needs of his new neighbours and an increasingly urban Langley. So next time you find yourself on Glover Road, or in the heart of Langley, watch out for Milner’s green hills and old farmsteads, and remember how they have served and continue to sustain us.